This afternoon Stephanie commissioned me with overseeing the kids as they wrapped presents for Grandma & Grandpa—presents they picked out themselves at the Dollar Tree. Have you ever wrapped presents with children 10, 8, 6, and 4? I barely escaped getting wrapped myself! At one point, I was trying to gingerly coach Carly in the art of folding the paper at the corners. In spite of my generous offering of free advice, she pretty much ignored me. In fact, I thought she hadn't heard me at all. But then, finally done, she held up her present with great pride. 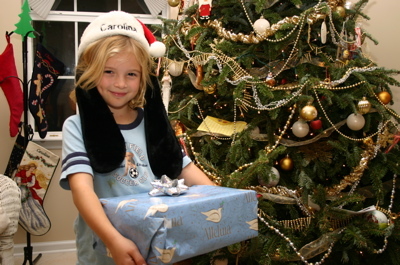 "Dad," she began, "when I get a present, I don't really care how it's wrapped on the outside. I just want to get to what's inside." I had to laugh. "I think a lot of people feel the same way, Carly." "And Dad," she continued, "I think God feels that way, too. He doesn't care how we're wrapped on the outside, he just can't wait to get to our insides." That was enough to make me think hard as I prepare for celebrating my saviour's birth in the next two days. Am I presenting him with what's on the outside or the inside? Paul said, "I appeal to you therefore, brothers and sisters, by the mercies of God, to present your bodies as a living sacrifice, holy and acceptable to God, which is your spiritual worship." Have an incredible Christmas! Like Paul, I urge you to give the Creator your spiritual worship this season.